1. Tie in your thread to bend. 2. Tie in the bunch of saddle hackle. Place some Zap-a-Gap at the hinge where the saddles leave the shank. 3. Tie in the body braid, and wrap foward to between an 1/8" and a 1/4" shy of the eye. 4. Tie in about six strands of flash. It helps to fold the flash around the thread, and then tie down. This would mean have 12 ends after tie down. 5. 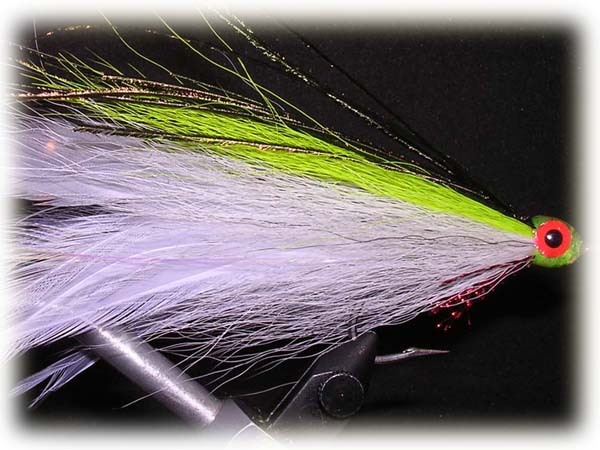 Tie in the bucktail. Put a third on each side of the hook and tie down. Spread out as you cinch down. 6. Tie in the counter shade bucktail or peacock on top of the already tied-down bucktail. 7. Add the throat. Once again fold about 8 piece of K-flash around the thread before you tie down. This will give you 16 tips. 8. Create the head of the fly and a nice taper. Add Zap-a-Gap. Whip-finish. 9. Tie in mono thread. 10. Stick on eyes of choice (I am a firm believer in making the eyes pronounced). Tie down eyes with mono and whip finish. 11. Epoxy and let dry.